Florida citrus has started! These early season gems are nice and sweet with just a hint of tartness. The skin is so easy to peel it practically jumps off the fruit! These are fresh from Uncle Matt’s right here in Florida. Carrots are more than a tasty addition to almost any dish. They are also good for your body’s overall health, especially that of the skin, eyes, digestive system and teeth! There are plenty more reasons to enjoy these crunchy, sweet root vegetables, so reserve a spot in your garden plot for planting some, or pop down to the local market to pick up a bunch. After you’ve stocked up on carrots try these delicious carrot recipes! A simple fresh green juice for both beginner and pro juicers. Put lemon juice in the bottom of the glass with ice. Place spinach, apple, and carrots into the juicer. See how much juice is made, then add that same amount of water to the mix. If it’s not sweet enough for you, add the other half of the apple or your sweetener of choice. Pour over ice, stir, sip and enjoy. This green juice recipe combines the aromatic and very green coriander (also known as cilantro) with carrots, apple, lemon, and ginger to create a taste sensation that awakens the brain and wows the taste buds. For best results use a masticating juicer that is able to juice wheat grass, as the coriander will not juice well in a centrifugal juicer. Wash and chop the carrots and apple. Peel the lemon and ginger, and chop to fit your juicer. Gorgeous – Refreshes the parts other juices don’t quite reach! Tip: The coriander juices most easily for me in my Samson juicer (a masticating juicer) when I juice a few stems at a time, rather than the whole lot in one go. The next recipe is a group favorite, which we serve at all our educational events. It’s perfect to top off your salad or make a hearty wrap. 2. 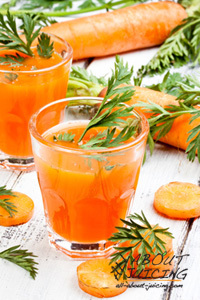 Place steamed carrots in a blender with steam water and remaining ingredients, except the scallions. Blend to a creamy consistency and pour into the pot. Simmer. Add the scallions while simmering. Stir continuously until gravy thickens. Remove from flame. Do not boil.Our Easy Carrot Grain Loaf is a hearty, scrumptious and versatile dish. You can even use leftover grain from the night before to make it or add your own variation of tasty veggies! Peel carrots and cut into julienne — quick work with a Japanese mandolin. Mash the garlic clove with the salt, mix it with the vinegar, lemon juice, and cayenne. Whisk in the olive oil. Taste for seasoning and add more acid, salt or cayenne if needed. Toss with the carrots and cilantro.